A wonderful group of woodland plants are Erythroniums, also known as ‘trout lilies’ and Pagoda Lillies. A wide ranging group from Europe through Asia and also in North America the most commonly grown would be Erythronium revolutum, however many other species and cutovers are worth considering as well. Erythronium howellii is pictured right. Grown mainly for the flowers which are attractive and interesting in form, the foliage of many species is also attractive, many mottled and marbled forms. These are a rhizome that prefer a humus rich moist soil and in general ‘dappled shade’. In the right conditions they will pull themselves down to a cool moist position and spread to form a nice clump over time. 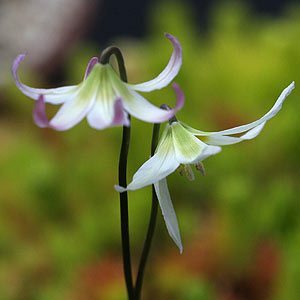 Erythronium can also be grown it pots or containers, although they will still drag themselves down and can even send out new growth through the holes in the bottom of the pots. An all purpose slow release fertiliser applied in spring seems to do wonders, both in containers and in the ground, however we also like to apply some seaweed fertilisers which seems to keep the rhizomes happy and helps them spread. As with all plants, when growing in pots they will perform better if repotted every 2-3 years as the potting mix breaks down. The dichotomy between good drainage and moisture, especially in containers is ever present, and we prefer to monitor moisture in pots, rather than use artificial water retention methods. Some growers like to use some water retention crystals in potting mix, we are not big fans of this as in wet seasons this can cause root systems to become overly wet and rot. These are a are spring flowering bulb that like to grow in similar conditions to that of cyclamen. Dig in some peat to help maintain moisture, part shade, keep moist. Try planting Erythronium species around rhododendrons. Erythronium ‘White Beauty’ has large white blooms and marbled foliage. Erythronium ‘Pagoda’ has lemon flowers on tall stems. Erythronium species such as americanum, tuolumnense, helenae, multiscapoideum, revolutum and grandiflorum are sometimes known as ‘Trout Lilies’ or ‘Dog Tooth Violet’. Native to Europe, North America and Asia. Erythronium ‘Pagoda’ with its drooping yellow flowers is a much sought after. Erythronium are regarded as a woodland plant. When dividing established clumps you will need to dig deep as these small bulbs ‘drag themselves down’ to coil moist soil.